Scott Young, DDS Contents Teresa M.
Teresa has long been considering cosmetic dentistry. Receding gums have exposed some root surface of her teeth, making them sensitive to hot and cold. She has to use a straw to drink all beverages in order to avoid discomfort. Chipping a central incisor was the culprit in encouraging her to complete her treatment. Teresa had sedation dentistry to help make her procedure comfortable. We placed ten upper and eight lower restorations, as well as a dental implant. 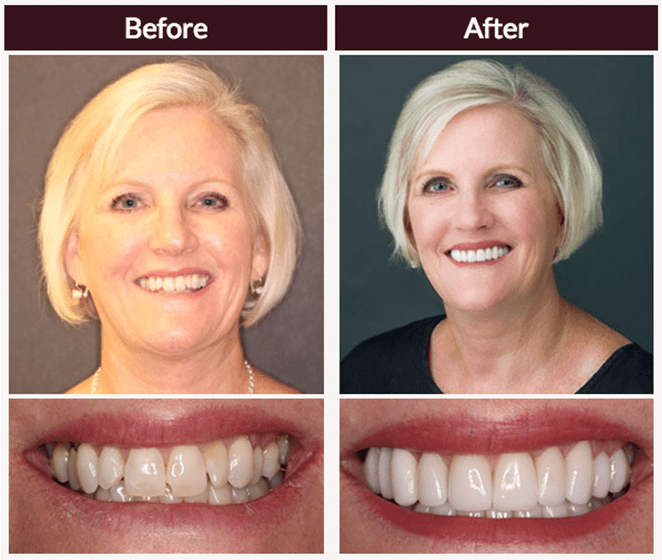 This not only improved the appearance of her central teeth, it improved the appearance of teeth further back that are exposed by Teresa's naturally wide smile. Her smile is brighter and more symmetrical. She wears a night guard at night to protect her teeth.